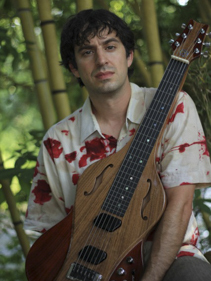 Billy Cardine is an innovative, genre-blurring slide guitarist, multi-instrumentalist, touring artist, and educator. He has performed at Carnegie Hall, The Kennedy Center, the Ryman Auditorium and major festivals, such as Bonnaroo, Merlefest and Rockygrass. He is an internationally featured artist touring in India, Japan, Europe and Canada as well. Billy’s dobro playing was recently featured on a Jerry Douglas’ production, Southern Filibuster, honoring one of the forefathers of the Dobro. Billy’s unique stylings and expertise attracted innovative analog music mogul, Moog Music. During 2010, he helped Moog design their first electric slide guitar, which he then debuted at MoogFest the following year. Billy’s distinct voice on all things slide has lead him to collaborations with Led Zeppelin’s own, John Paul Jones and world renowned, Edgar Meyer in his Porous Borders of Music. Billy’s productions have won national and international awards and recognition including Indie Acoustic Music Project’s Roots Album of the Year, Chicago Tribune’s Best Bluegrass records of the year and an Apple iPod Playlist Hot Pick. His memorable compositions and exquisite playing have been featured on The History Channel’s “Our Generation”, BBC World’s “Destination Music”, and PBS’ “RoadTrip Nation”. Billy newest release for July of 2012 introduces the Dobro to Gypsy Jazz music in a ground-breaking album featuring an extraordinary band.